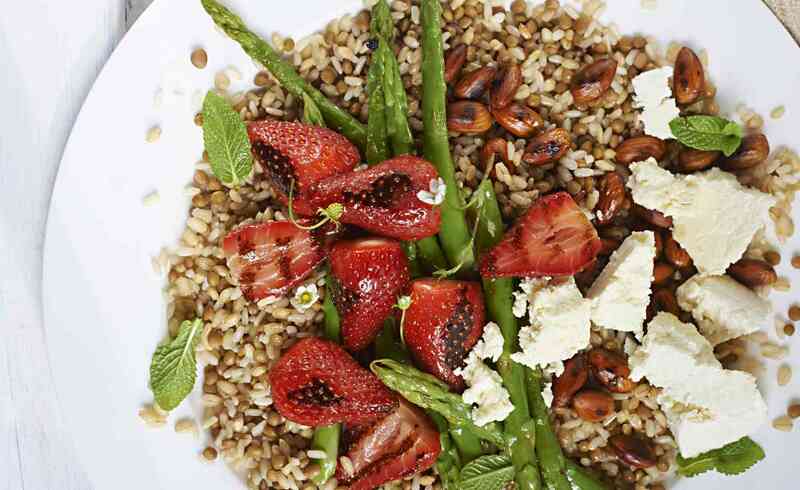 This Barley and Lentil Roasted Strawberry Salad is sure to set tongues wagging. Use delicious Victorian Strawberries in savoury dishes to impress the herd. Cook the barley and brown rice in boiling water for 35 minutes, and add brown lentils just before draining to warm through. Drain well. In a non stick pan, toast almonds, asparagus and strawberries until charred. Serve barley mix topped with asparagus and berries. Add torn mint and ricotta. Serve as is or drizzle with some extra virgin olive oil and balsamic vinegar.